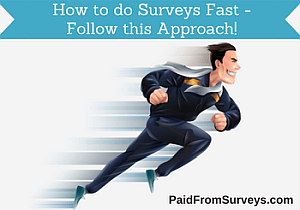 How to Do Surveys Fast - Follow this Approach! How to Do Surveys Fast – Follow this Approach! Some people that have tried to do paid surveys online will say that it is not worth it because it takes too long to do a survey. Some surveys can also take long, but it does not have to take too long to do a survey, and if you do it regularly with the right approach, it can give you some nice extra cash without spending too much time. I have done hundreds of paid surveys, and in this article, I will tell you how to do surveys fast, but still do them honestly. Can I be honest and still fast when doing surveys? This is for me a very important aspect when I do surveys. After doing surveys for a while, you will get to see that many of them have a similar structure, and a similar way of asking questions. That means that especially the basic questions about your demographic info etc. you will be able to answer very quickly. And in general, you should as mentioned of course be honest, but also not to such an extreme degree that you spend several minutes on analyzing and thinking about every single question. In the beginning, I was thinking too much about the answers I was giving, and if it would be the right answer – there are as such no right or wrong answers in surveys. Just tell what your initial thought is. Companies are anyway mostly interested in your initial thoughts and ideas. For example, if you are to give feedback on a TV commercial before it is aired. Then they want to know what your first thoughts are, because that will very likely also be the first thoughts of other people as well. And other people that are not doing a survey and just watching the ad on TV, will not sit and analyze it in most cases but just react in a certain way. So by not overthinking and not overanalyzing, you are in many cases giving the companies more valuable information, and at the same time save yourself a lot of time. Even though I am a big supporter of paid surveys and doing them online, I must say that sometimes you will run into surveys that just have too many stupid questions or that keep repeating the same questions. Luckily it is not that often, but it does happen and how often it happens depend which survey sites you are using. In those cases, I will do one of two things not to waste my time. If I find out in the beginning of a survey and can see that it will just be too long and repetitive, I will simple just leave the survey and find another instead. If I have already invested some time in a survey before I realize this, I sometimes just decide to not care about my answers, and just pick answers as quick as possible. This is of course not ideal, and not something I as such will recommend and not something I do too often. And you should also be aware that surveys often have built in test questions to see, if you are paying attention, so you still have to keep an eye on the questions. But I have also run into a few surveys that seemed like the company behind had not put any effort into making it user-friendly at all, and just kept asking the same questions several times, and then I think it is fair enough to just get it over and done with. By being strategic I refer to choices you can make in some surveys. There are for example often surveys I have done where I in the beginning have to indicate how well I know a number of different companies or brands. In some cases there might even be 50 companies to choose from. By now I can most often figure out how that information will affect the rest of the survey. In some cases, all the companies you select that you have knowledge of, will be some you have to answer further questions about. So if I sense that this will be the case, I only select the few I know the very best. I am still honestly saying which companies or brands I know the best, but I also know that I am not interested in answering further question about for example all 50 of them, even though I might actually know the name of most of them. So by being strategic, I am just choosing the ones I know the best, and then I know the survey will also only have a fair length. But I will of course then answer honestly on questions about the companies that I need to answer questions about, but I do just not want to do that about 50 companies. The rewards you get for a survey in relation to the time spent can vary quite a bit depending on the site you are using and depending on the specific kinds of surveys you are doing on that site. Usually, you will be able to see an indication of the time a person on average spends on a survey and the reward, before you start. Sometimes you can already here decide that a survey is not worth it, and just find one that gives a bit better reward. But also please remember that there are also other reasons to do surveys than just the cash, even though the money is definitely for most people also an important aspect. But do not let the estimated time scare you – I am in most cases by now able to do the surveys faster than the indicated time while still being honest and answering properly, and sometimes a lot faster. 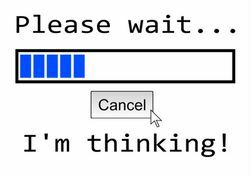 As you get used to answering surveys, you will automatically become faster. In general, some survey sites also just have surveys with better rewards than others. Which ones the best are can vary depending on the country you live in. In my overview of the best survey sites you can get an idea about what the different sites has to offer, and read further in the reviews of each of them. This should give you a good start to select the right sites from the beginning. But as I said, it can vary from country to country, so it can be a good idea to sign up for several of them and test them out, and see which ones are the best for you. What does it mean to do a survey fast? You might by now be thinking how fast you can actually do a survey. I will say that it should not be all about the speed. If you are doing surveys to get rich quick, you are going in the wrong direction and will probably be disappointed. But by using some of the approaches I have presented here, it will in my experience be fast enough to both provide valuable information to the companies that pay you to do the surveys and also not too boring for you. Can I be even faster by cheating survey sites? 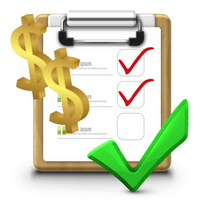 I know some people are trying to use different software to cheat survey sites and that way make quick money. But this is not an approach I will recommend. 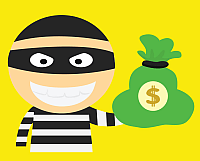 It is too risky to use these kinds of tools as there is a great risk you will be blocked from the survey sites you use it on, and it is also a dishonest way of making money. Further, I have also not seen any proof that such a tool actually works and is not just a way to get people to buy a software. So do not bother to spend your time and money trying to find a solution like this. Will doing surveys fast make me rich? I will finish this article by making one thing clear that I try to make clear in most of my article – you will NOT become rich from doing paid surveys. Even if you are the fastest person on earth to do surveys, or if you found a software that could take all your surveys for you, it will not make you that kind of money. It can give some nice extra money on the side, but if you are looking to make big money online, you should look in other directions. I hope this article has given you a better idea about an approach you can use to do surveys at a reasonable speed, so it will be worth your time and effort. Please feel free to leave a comment below, if you have any questions. I will get back to you asap. What do you think of these mikael, Engageme tv, Mindspay, livesample, and pollpass? Engageme tv offers videos through many other sites. I, in general, do not use the video option they offer a lot as the rewards usually are quite low. But it is a legit way to earn. The other sites are still on the list of sites I have to check out. Thanks for a few more ideas about platforms that are good to look into and review. I live in Singapore. Is Clixsense available in Singapore. I only have Paypal. Did you see my reply to your question on the ClixSense review? But yes ClixSense is available in Singapore, and it gives fairly good opportunities there. However, if you only want to join sites that pay out through PayPal, ClixSense is not the right site for you as it does not offer this. You can instead use Payoneer or Skrill which are also both free to sign up for. But if you only want to join sites that pay through PayPal, you can instead check out my list of the best survey sites in Singapore, where you can get an overview of which sites offer this payout method. i try to complete surveys ..but all the time , after answering one page of questions , it says “no more survey available”…. Can you tell me what country you live in, and what survey sites you are a member of? In general there will always be surveys where this will happen. The trick is to figure out which sites/portals that this most often happen to you, and which ones you qualify for the most often. This takes a little bit of time, but after a while you will know, and then you just focus on taking the types of surveys you know you have the biggest chance of qualifying for. I have some portals I just cannot even be bothered to try any more, and others where I know that I probably qualify 30% of the time, and these I still use, as it is worth it and does not take long to see, if I qualify or not. And then there are sites where I qualify for more or less all of the surveys, and these I of course also use. But it depends a lot on the survey sites and the country you live in, so if you do not mind telling me this, maybe I can say more. Hi, great article about efficiency when doing surveys. What survey platforms do you recommend? I myself liked usertesting . com but they didn’t accept me as a member. So I’m looking for other directions. Do you personally have good experiences with some platforms? I know i won’t get rich, but just for some extra pocket money. You can check out my top 10 list here on this website to see the platforms I have found to be the best. Which ones that are exactly the best for you does however depend where in the world you live. ClixSense is one of my favourite sites, and gives opportunities to people in most of the world. If you live in the US, Canada, Australia, UK, Germany or France, CashCrate can also be a great site. But there are plenty of other good sites as well, so the best is to check out the top 10 in my main menu, and read a bit more about the different sites to find the ones that suits you the best. I will check out the site you mention. Thanks for the tip.